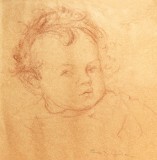 Cora Josephine (known as "Jo") was born in Buxton, Derbyshire, was an accomplished musician ( http://www.janandcoragordonart.com/2018/04/cora-josephine-turner-and-buxton.html ) and studied art at the Slade School of Fine Art. Some of their early biographical details are summarized in the 1939 edition of "Two Vagabonds in Serbia and Montenegro" ( http://janandcoragordonart.blogspot.com/2014/05/jan-and-cora-gordon-1939-biographical.html ) and Ken Bryant's Preface to the 2007 Bene Factum edition of "Two Vagabonds in Languedoc." Jan and Cora were married on July 7th 1909 at the Parish Church of Saint Luke, Chelsea. When the war ended the Gordons returned to Paris, but from time to time they visited their friends in England and exhibited art. For example in April 1925 they had a show at the London Gallery XXI (Graham Sutherland, who appears in Jan's much later "Art Ain't All Paint", had his first exhibition of drawings and engravings at this gallery this same year). See: http://janandcoragordonart.blogspot.com/2014/10/jan-and-cora-gordon-and-xxi-gallery.html . The Gordons returned to England for good in 1932 (the story is recorded in "The London Roundabout", https://pbase.com/hajar/jan_and_cora_gordon_books ), later producing a distinctive series of paintings of London scenes. See also: http://lifeartearth.blogspot.com/2013/01/jan-and-cora-gordon-return-to-london.html . My favourite Cora J. Gordon painting dates from this time ( http://janandcoragordonart.blogspot.com/2014/04/jan-and-cora-gordon-ginger-cat-to.html ). The first four pictures below were made during and just after the First World War (1916 - 1919), the remainder during the 1930s.